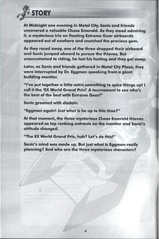 The following are instruction manuals for the GameCube, PlayStation 2, Xbox and PC game Sonic Riders. convert: no images defined `/tmp/transform_42fae42454fb.jpg' @ error/convert.c/ConvertImageCommand/3258. At Midnight one evening in Metal City, Sonic and friends uncovered a valuable Chaos Emerald. As they stood admiring it, a mysterious trio floating on Extreme Gear airboards appeared out of nowhere and snatched the precious gem. As they raced away, one of the three dropped their airboard and Sonic jumped aboard to pursue the thieves. But unaccustomed to riding, he lost his footing and they got away. Later, as Sonic and friends gathered in Metal City Plaza, they were interrupted by Dr. Eggman speaking from a giant building monitor. "I've put together a little extra something to spice things up! I call it the 'EX World Grand Prix!' A tournament to see who's the best of the best with Extreme Gear!" "Eggman again! What is he up to this time?" At that moment, the three mysterious Chaos Emerald thieves appeared as top ranking entrants on the monitor and Sonic's attitude changed. "The EX World Grand Prix, huh? Let's do this!" Sonic's mind was made up. But just what is Eggman really planning? And who are these three mysterious characters?